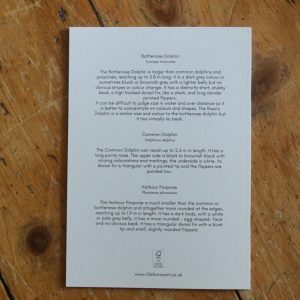 The Cetaceans Pocket Notebook contains 38 plain pages. Its size makes it perfect for putting in your bag or pocket, for making lists, taking notes, sketching and doodling while you’re out and about. Both the cover and the paper are 100% recycled. All Artwork is from originals by Ian Hughes. 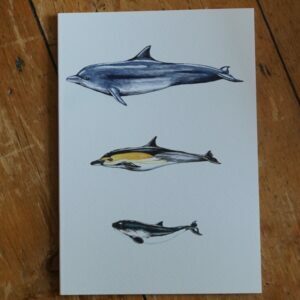 This notebook features art work of the three cetaceans most commonly seen around the British coast, the Common Dolphin, the Bottle Nose dolphin and the Porpoise. 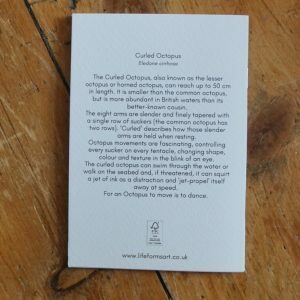 On the back cover is information about each species to help identify them when you’re out dolphin spotting.